I would be shocked if a driver would accept a trip to Berne, but anything is possible. My GF and I took a Lyft home to Albany from Troy last Saturday night. everyone should know this feat was impossible prior to this month. It took us about 10 minutes from the time was started looking for the ride to being in the car and on our way. The driver and trip were excellent. The ride was $24. I've used both Lyft and Uber about 6 times between the two. All positive experiences. Not as cheap as I though they'd be though. Used 3 times so far. So far very good experiences. Only drawback is the price. I used the "Free ride up to $5" promo with lyft going from Troy Little Italy to Troy Wolff's Biergarten and still had to pay about $5 out of pocket. $10 is steep for a .9 mile ride. I've used both, but prefer Lyft personally. Great experience. Fast pickup times. I was chatting with one of my drivers about potential Saratoga -> Albany types of drives or similar. He is actually based in Delmar, and said that as a driver, Lyft has a feature that you can pick a fare based on the direction you want to end up in which I thought was interesting. He was driving around all night and lives out in Delmar but ended up more towards Saratoga when he was about to call it quits. His last fare was a drive from Saratoga back towards Albany and got him pretty close to home as well. That makes me feel better about catching a ride to a place further in NY if I happen to need one. Anyone try the local Schenectady care hailing service called FARE? Per the Gazette it is locally owned. I've used Lyft three times. Agreed that it's not as cheap as I expected, but it's worth it. The cars are clean and the drivers are friendly. Moved to Albany from Manhattan last year. The region's cab service was a challange. Never on time. Each call to check on drivers whereabouts was greeted with " on the way". Uber! Simple app, driver arrives. Car not filled with a host of strangers. Not choking from overkill of air fresheners. And best of all cheaper or the same as riding in a beat up mini van emblazoned with ads. Used Lyft on the very first day and it was perfect. Driver arrived quickly (3 min), was courteous and his car spotless. The ride was fairly priced too. I will definately use Lyft again and again. Used both, to and from the airport. Uber was talked to by the Albany County Sheriff, because Uber doesn't have an agreement with the airport yet. Otherwise, both were much better than previous Albany cab experiences. I just tried to use Uber to get home from the airport this afternoon and was informed it's not yet allowed. A fun surprise after a day of traveling. I haven't tried to use it otherwise though. Slightly off topic, I have used the Albany Designated Driver service from Troy to Schenectady and I believe it cost $40, and they bring your car home for you. Highly recommend, sounds like costs may be comparable to Lyft/Uber. I'm still a Lyft/Uber virgin but I can't imagine it could be worse than feeling like you're about to die in a fireball on I-787 at 1am. I look forward to my first ride...honestly. I am the admin of a Facebook group of over 150 Uber and Lyft drivers in the Albany/Saratoga area. Any one of us would be happy to get a trip from Albany to Berne. I have personally gone from the airport to Cobleskill and know others who have gone as far as Pittsfield MA, Long Island, and Cooperstown. Long rides are no problem for many of us. I hope everyone gives us a try! I'm an Uner driver. I'll gladly go to Berne! Took Lyft from Delmar to Albany and back a couple times and it's been wonderful. I've taken Uber a dozen times now around the region and have had nothing but pleasant experiences. Never had to wait more than 7 minutes, every car was clean, and my drivers were all friendly. The overall experience is far superior to our options before. I had two good rides with Uber and one with Lyft. I had one weird ride with Lyft though; driver had to call me to find where Black and Blue on Western Ave. was for the pick up, phone number was from Washington State. He started the ride before he even picked me up which was weird and then he shows up in some out of state taxi cab. Since he started the ride already he didn't know where to bring us home so we had to direct him. He was clearly from out of state, didn't know the area and was driving a van that had an unfamiliar taxi company on it. If I wanted a crappy taxi ride, I would have called a taxi. Thanks for the feedback! We used Lyft and had a great experience. About $30 including tip. It was 5 minutes from request to pickup. We'll definitely use Lyft again. We didn't use the service for our trip home as we met up with a friend who had committed to the DD role for the evening. Used UBER a few times. LOVE IT and hope all the horribly bad karma the cabs companies have placed on themselves cause them to go out of business. Since Cabs were such an insulting rip off- I am fine with the prices I have been quoted. It least its open and honest pricing. So far the wait times for getting a passenger are a bit longer than I expected, but when they finally do come in it's been a pretty good experience so far. 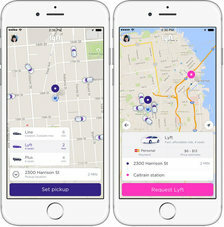 If you're thinking of driving Lyft is offering a nice bonus of $200- $4 extra with promo code: AlbanyLovesLyft for every ride you give on the first 50 rides. It's worth giving a shot and is definitely worth it for the first 50 rides you give. 1) While the base fare is $7.00 for both companies, Lyft passes other fees on to the customer (a service fee, the New York State surcharge, and the Black Car fund surcharge), while Uber does not. That means Lyft has been a couple of bucks more expensive per ride. I think the trade-off is that Lyft seems to have much more gentle increases for surge pricing. Interesting to see how long Uber continues to eat those fees instead of passing them on. 3) Some of the navigation platforms need to work out the kinks. One weakness with ride-hailing as opposed to cabs is that a driver unfamiliar with the area is totally beholden to the GPS for direction, and if that fails, you could be on for a lengthy detour, especially if you are unfamiliar with the area. Say what you will about Albany cab service, but I never had an issue of a driver getting lost. I've had to correct a drastically wrong GPS direction once already in an Uber, so it is worth paying attention to assist drivers. My son goes to school in Troy. He takes ride to get to the airport and and back to school. Some lyft drivers overcharged him. He was charged $26.32 to the airport. After spring break, he took lyft ride back to campus and was charged $52.11. He was not told how much the charge was until I got his card statement. That is daylight robbery. The company should investigate the driver. I tried to find Lyft number, but no information can be found. I am very disappointed in this practice. I hope there will be some guidance for drivers to follow.